Pretty younger girls white long sleeve blouse from Fina Ejerique, has a large scalloped collar, the sleeves have elasticated ruffled cuffs, and fastens with buttons to the back. Matches perfectly with our red chevron bloomers. Younger girls red and white chevron dress from Fina Ejerique. 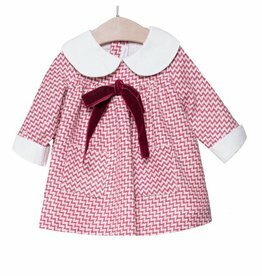 This cute dress has a white peter pan style collar and turned up sleeve cuffs, also with two frontal pockets and center velvet bow. The dress is fully lined and has a buttoned back fastening. These super cute red and white chevron braced bloomers by Fina Ejerique have an elasticated waist for great comfort, gathered leg hems and a side burgundy velvet bow.